This post contains amazon affiliate links which means that if you make a purchase after clicking one of those links, I will get a small commission. This post was originally posted on November 8, 2017. I have never roasted a full turkey. In fact, up until a few weeks ago, I’ve never even cooked any turkey not counting ground turkey meat. It just seemed daunting, all those enormous turkeys that were sold in the stores. A few months ago I tried getting a turkey breast. I went to one of my favourite stores with a really big and diverse butcher counter and asked for the smallest turkey breast they had. It was gigantic. Something that was the size of a whole chicken if not bigger. I left empty-handed. Then a few weeks ago I saw a small skinless and boneless turkey breast at a local store and jumped at the opportunity to finally cook it. Suddenly, those smaller turkey breasts were everywhere and I felt inspired. I don’t have many traditions. Coming from a different country, it took years before I felt home in Canada. Now, Canada is my true home and I live here more than half of my life, yet holiday traditions never formed. I don’t go crazy if there’s no creamed spinach, or green bean casserole, or pecan pie, or insert your favourite Thanksgiving food here. By the time I moved to Canada, my dad’s family has already been here for a few years. On Thanksgiving my stepmom makes the most delicious turkey. It’s juicy and flavourful, covered in auburn crispy skin, and stuffed with nuts and fruit. That’s about it for the Thanksgiving food on the table. My in-laws, on the other hand, make a few traditional sides to go with the turkey, there’s always spinach, and sweet potatoes, and even stuffing. In Canada, Thanksgiving is in the beginning (or middle) of October. We usually go to visit my hubby’s family for the traditional turkey and stuffing meal, but with the baby and the nap schedules and the set bed-times, it’s difficult to travel there. So, I’ve missed on the proper Thanksgiving feast this year (2017) and even last. But this week my house smelled like fall and turkey and sage and rosemary and family and happiness because I made the Sheet Pan Thanksgiving Dinner for Two (or two and one extra tiny human). one bowl to mix the stuffing. It’s really easy to make and even with all the chopping and prepping it could be done in just one hour. Yes, you read it right, just ONE HOUR! Ok, ok, you have to be quite efficient with chopping but it’s totally doable with 20 minutes of chopping and mixing and then 40 minutes in the oven. 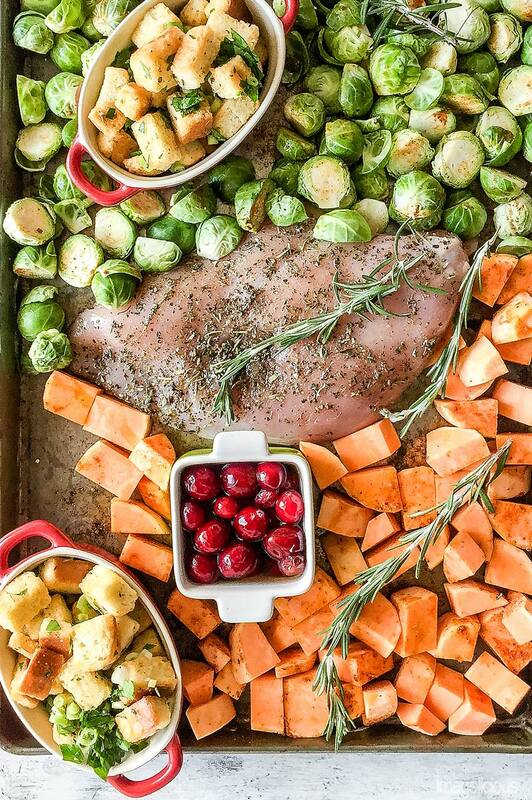 So, how do you make my full Sheet Pan Thanksgiving Dinner for Two? Easy! First, you peel and chop the sweet potatoes, then you prep and halve the Brussels sprouts. Mix frozen cranberries, maple syrup, and apple juice in a small oven-proof bowl. Chop some parsley, green onion, and mix with your favourite store-bought croutons (or boxed stuffing) and some seasonings, then divide between two ramekins. Rub the chicken breast with more seasonings. Add all the chopped veggies, and ramekins to the sheet pan and bake for 35-40 minutes. 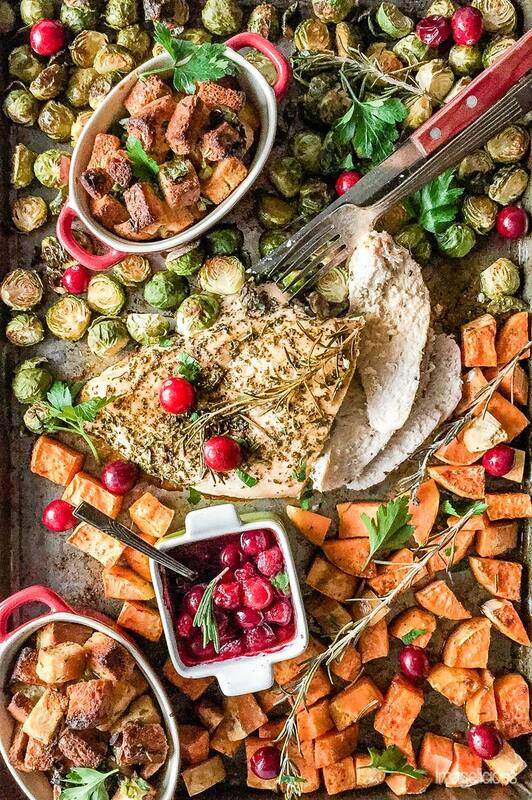 Once baked, the Sheet Pan Thanksgiving Dinner looks absolutely gorgeous!! Garnish with some fresh herbs and cranberries and you have a show-stopping platter! TIP: It looks so beautiful that you might even want to make two of these trays and serve them family style for the whole family. Have you heard my BIG news??? Well, I am writing a COOKBOOK!!! Can you believe it? I certainly am still a bit dazed by this idea. I’ve been a little bit quiet on my blog over the past few months and that’s because I was developing, testing, testing, testing some more, and photographing 75 delicious recipes! I just turned in my first draft last week and now I eagerly await the edits. 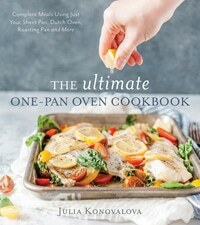 The cookbook name is “The Ultimate One-Pan Oven Cookbook” and the release date is currently set to be at the end of August 2018 which is just perfect for the book concept as the cooler weather in the weeks ahead makes the oven recipes more enticing. Also, if anyone is looking for Holidays 2018 gift ideas, then my cookbook will be the perfect gift (*blushing slightly*)! I am super grateful for this opportunity to the Page Street Publishing distributed by Macmillan, one of the Big Five publishers. They emailed me in April 2017 with this crazy idea and I jumped at the opportunity. I still can’t believe that I am going to have a real cookbook!!! Do you want more sheet pan recipes? Since I originally wrote this post a year ago, I am ecstatic to say that my cookbook is ALREADY PUBLISHED!!! 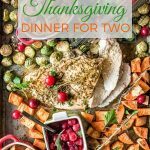 Watch this video to see how Easy it is to make the Sheet Pan Thanksgiving Dinner for Two and how beautiful it turns out!! 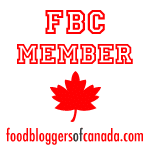 In a small oven-proof ramekin, combine the cranberries, maple sauce, and apple juice. Set aside. In a medium bowl, whisk the egg, add the chopped green onion, parsley, seasonings, and mix well. Add your favourite croutons, broth, and mix to combine. Divide the stuffing mixture between two oven-proof ramekins and set aside. Rub the turkey breast with the olive oil and all the seasonings. Place the seasoned turkey in the middle of a sheet pan. I use 11x17" size sheet pan. Spread the vegetables around the turkey breast in one layer. Drizzle with the olive oil, sprinkle with seasonings and mix well. Move the vegetables around to make space for the three ramekins. Add a few sprigs of fresh rosemary to the vegetables and turkey. Bake for 35-40 minutes or until the sweet potatoes are soft and the turkey breast reaches 165F internal temperature. Sprinkle with a little bit of chopped parsley, add a few fresh cranberries and serve. The cranberry sauce won't be thick since it's not cooked on the stove but it will be delicious! If you prefer sweeter sauce, add extra maple syrup and reduce the amount of apple juice. You could butter the ramekins for the stuffing if you'd like but it's not necessary. I have often been cooking for 1 or 2 on a holiday and would have loved a recipe like this. I have saved it for the next time I need one. The food looks so beautiful! Thank you! I hope you try it the next time! 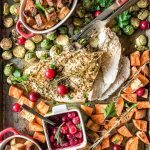 A sheet pan meal for Thanksgiving? I’m in! What a great way to make Thanksgiving dinner manageable! 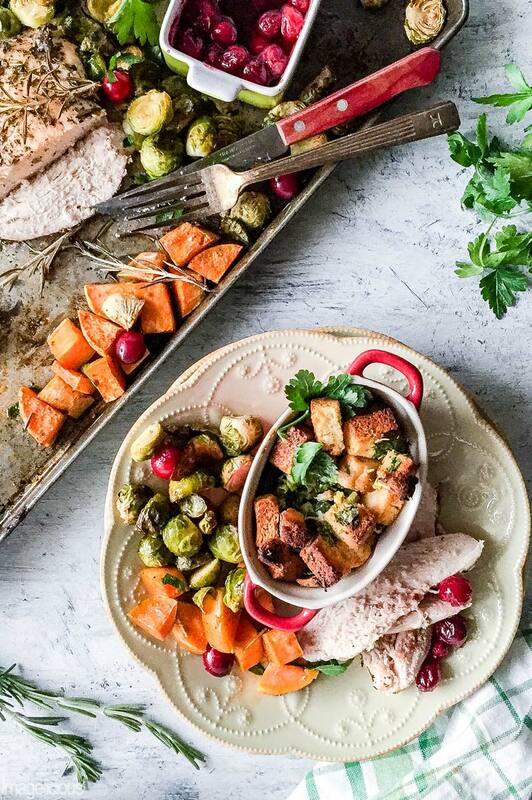 I’m such a fan of brussels sprouts personally, so I would be all over those on this sheet pan. 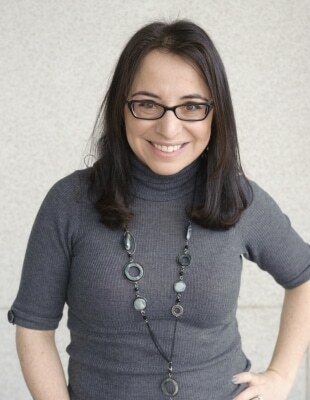 Congratulations on your book! What wonderful news! I love Brussels Sprouts too! So yummy and delicious! and healthy! Thank you! I think you could add the red onion. I would just slice it a bit thicker since if it’s sliced thin it could get burnt in half an hour. This is amazing and so easy to prepare! Love that it covers all the basic dishes! Congrats on your cookbook! 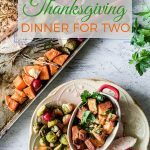 This is a perfect Thanksgiving dinner for two. It is so simple and looks delicious.